Waterborne coatings are surface coatings or finishes that use water as a solvent to disperse the resin. Composition of waterborne coatings varies; these coatings may include as much as 80% water with small amount of other solvents such as glycol ethers. The content of water is high in waterborne coatings. Therefore, these coatings are environmentally-friendly and easy to apply. Waterborne coatings provide excellent surface properties such as anti-sealing effects, high gloss, and rub resistance. Waterborne coatings are excellent primers due to their resistance to heat and abrasion. They create strong adhesion, and can be applied in thick or thin coats. They also allow for easy color blending and changes. Waterborne coatings can be applied on inner and outer surfaces. These coatings help protect the surface from corrosion and provide high gloss, wetting, and stabilization. Waterborne coatings are used to increase surface resistance from weathering and rust. They are also used to improve esthetics and durability of structures. Waterborne coatings offer many advantages. For instance, they are ideal primers as they possess good resistance to heat and abrasion. Additionally, they provide excellent adhesion, and low toxicity and flammability due to low VOC levels and HAP emissions. Waterborne coatings also help lower volatile emissions. Based on resin, the waterborne coatings market has been divided into acrylic, formaldehyde, polyurethane, alkyds, epoxy, and others. Acrylic is the dominant segment of the market. Acrylic resins are employed for various purposes. Replacement of solvent-borne coatings with high-performance waterborne alternatives can offer advantages such as lower solvent exposure and associated health risks, fewer concerns with flammability, easy soap-and-water clean-up, and less hazardous waste disposal. Acrylic coatings are often used on exterior surfaces or high traffic interior surfaces such as doors, frames, trims, or wall surfaces. They are durable, keep their color intact, and dry quickly. Acrylic coatings are more durable, as they are flexible, moisture resistant, and breathable. Common areas of application of high performance acrylics include direct-to-metal applications, primed metals, and furniture & flooring and masonry surfaces. They are used directly on metal or as top coats for most colors and gloss levels. Various government bodies are adopting regulations regarding the emission of VOCs. This is a key factor driving the waterborne coatings market. Based on type, polyurethane is likely to be a highly lucrative segment of the market during the forecast period. It is also expected to expand at a rapid pace during the forecast period. Polyurethane is particularly recommended for application on surfaces that are subjected to high level of wear and tear and require chemical and physical resistance. Polyurethane is primarily used on metals, textiles, and plastics. Alkyd waterborne coatings tend to take longer to dry than solvent-borne coatings; however, the end result has similar gloss, and flow and levelling properties. They are versatile, as they can be thinned with water to almost any viscosity. Water-based alkyds can be applied with spray or dip applications, and are one of the cheaper VOC-compliant coatings. The waterborne coatings market is primarily driven by the increase in urbanization and industrialization in developing regions, especially in China and India. Implementation of stringent government norms related to emission of VOCs in these countries is another factor boosting the waterborne coatings market in Asia Pacific. In terms of application, the waterborne coatings market has been segregated into building & construction, automotive, furniture & flooring, electronics, marine, paper & printing, and others. Building & construction is the dominant segment of the waterborne coatings market. Increase in demand for building & construction coatings and growth in infrastructure activities across the world are major factors driving the global waterborne coatings market. Building & construction coatings are used for interior and exterior coatings of walls to enhance the appearance of buildings. Waterborne coatings are also employed in the automotive sector. Most car manufacturers are committed to large-scale adoption of waterborne coatings. Market share of waterborne coatings is estimated to increase as new production lines are commissioned. In terms of volume, Asia Pacific dominated the global waterborne coatings market in 2017. The waterborne coatings market in the region is primarily driven by the rise in infrastructure requirements in residential, non-residential, and commercial sectors. The building & construction segment in Asia Pacific is projected to expand at a rapid pace in the near future. Increase in demand for decorative paints and coatings in India and China, coupled with rise in awareness about waterborne coatings is driving the market in the region. Growth in population in Asia Pacific is propelling the construction industry in the region. This, in turn, is augmenting the building & construction segment. Regulations on emission of VOC are becoming increasingly stringent in countries such as China and India. Therefore, manufacturers are switching to environmentally-friendly technologies. The trend of using waterborne coatings is expected to gain momentum in the near future. The global waterborne coatings market is highly competitive. 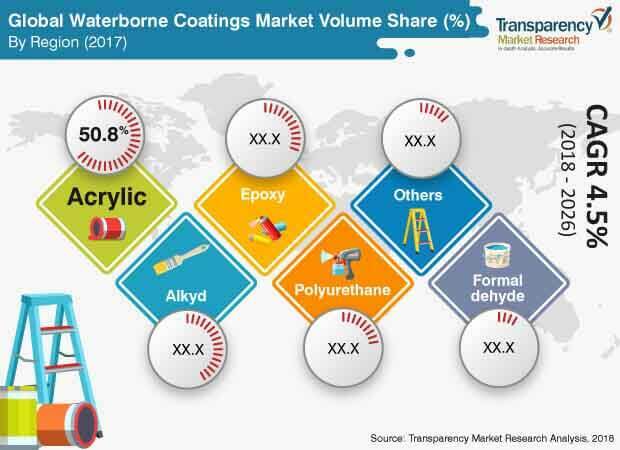 Key players operating in the waterborne coatings markets are BASF SE, Akzo Nobel N.V., Asian Paints, Axalta Coating Systems Ltd., Altana AG, PPG Industries Inc., and Sherwin-Williams.